Veterinarians and pet owners have long understood the benefits of Omega 3 fatty acids. 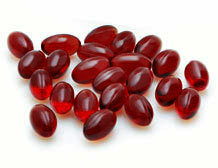 Over the years the market has been flooded with a number of fish oil capsules claiming high levels of the omega 3′s eicosapentaenoic acid (EPA) and docosahexaenoic acid (DHA). But now there is an omega fatty acid supplement that is far more powerful when if comes to supporting joint mobility. That product is Flexerna Omega, a patented formulation, providing a concentrated purified extracted oil from the Green Lipped Mussel of New Zealand (Perna canaliculus). The Flexerna Omega Difference is Eicosatetraenoic Acid (ETA)? Flexerna Omega is the only patented omega fatty acid supplement proven to have effective levels of the three main Omega 3 fatty acids shown to be beneficial in supporting overall joint health. Flexerna Omega is also the only green-lipped mussel extract with a patented extraction process to optimize purity and concentration. What sets Flexerna apart from fish oils is the omega 3, eicosatetraenoic acid (ETA). Research studies have shown that ETA is more powerful than EPA and DHA combined. Polyunstarurated fatty acid found in cell membranes. Is involved in cell signaling and also is a key inflammatory intermediate. Important to understand AA works a both anti-inflam and inflam. Flexerna has been shown to contain high levels of a lipid, a long chain fatty acid (20 + fatty acid residues) called Eicosatetraenoic Acid (ETA). This omega three has been show to be stronger than EPA and DHA alone. Whether your dog has or has not previously been on a Omega supplement, TopDog recommends a proper loading dose phase for Flexerna Omega. Therefore, in the first 10 days the maintenance dosage is doubled. 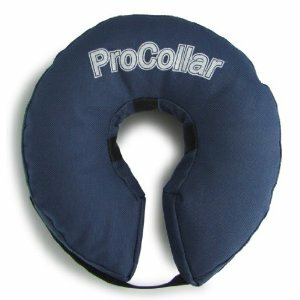 Though many dogs show improvement in only a few days, it is best to allow 4-6 weeks of continual usage to see the full results. 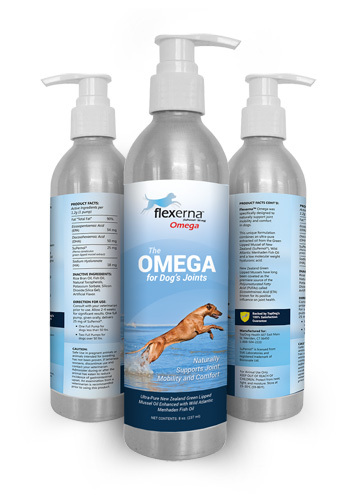 Puppies to Older Dogs can benefit from Flexerna Omega. Being proactive in preventing problems is the best thing to do. **Based on independent research studies. Studies available upon request. These statements have not been been evaluated by the FDA. These products are not intended to diagnose, treat, cure or prevent disease. 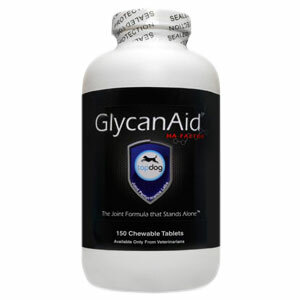 All TopDog products are manufactured and/or packaged in an FDA inspected facility. Supernol(R) is a registered trademark of Bionovate Ltd.
Macrides TA, Treschow AP, Kalafatis N, Wright PFA. The antiinflammatory effects of Omega 3 tetrainoic fatty acids isolated from a lipid extract from New Zealand green-lipped mussel. In: Procedings of the 88th American Oil Chemist Society Annual Meeting: May 1997, Seattle; 1997.